Millets have become a staple in our house for quite sometime now. Foxtail millet is excellent in pongal/khichdi, and it comes out so soft, flavourful and perfect that you will never miss rice in this recipe. This is a one pot meal, so perfect for all those lazy weekend mornings! 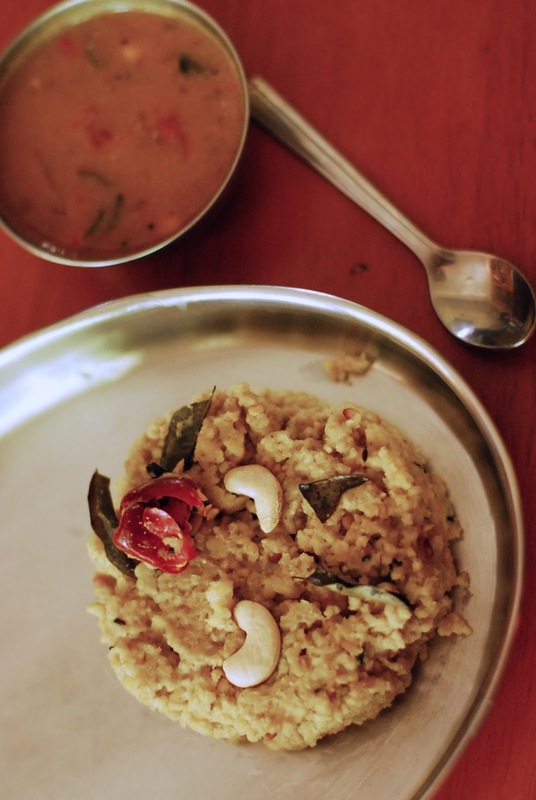 Goes well with any sambhar or chutney. Curry leaves, dry red chillies, as per your taste. I took 3 red chillies. 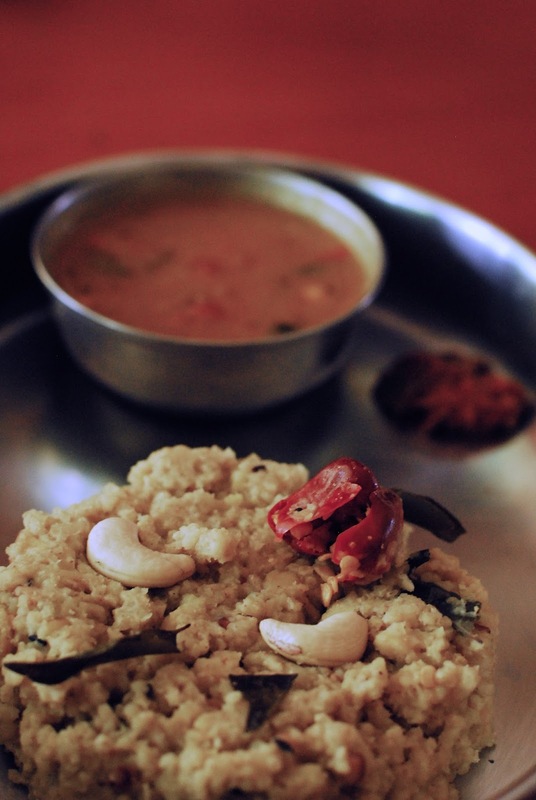 Soak the millets in water, for around 15-20 minutes. Drain and set aside. Take a pressure cooker/pressure pan, and heat some oil in it. Add mustard seeds to it. When it splutters, add the pepper corns and jeera seeds. Now add the curry leaves, ginger, red chillies, cashew nuts, asafoetida and sauté well. This will give a nice aroma at this stage. Now add the washed and drained yellow moong dal, and saute for a minute. Add the millets, water and salt to taste. Mix well. When the water starts to boil, close the pressure cooker. cook till 4-5 whistles. 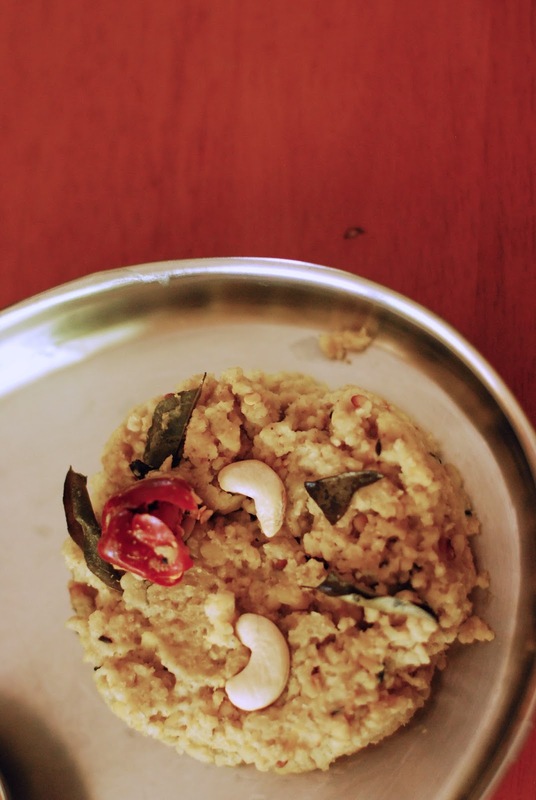 When the pressure goes, open the cooker, and nicely mix the pongal. If you wish you can sprinkle some freshly grated coconut on top before serving.